This Christmas, our family is missing our four-footed family member. 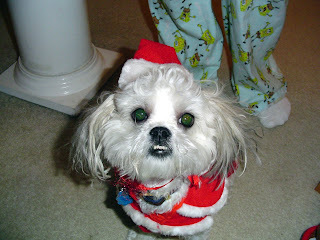 We lost our sweet Bailey Grace with a silly face due to liver failure in March 2011. She was a month shy of her tenth birthday, and she had lived with me since she was only a few months old. When Bailey first passed, I couldn't imagine opening my heart to another dog. I thought maybe we would get another dog when our son started kindergarten and I would be home alone all day. But as the months have gone by, and especially as our son (who will be an only child) has started talking about wanting a puppy, I think we will be a family of four again sooner rather than later. We've started looking around and are pretty sure we'll get another Shih Tzu, or at least a Shih Tzu mix. We'll look for a black and white puppy that will look a little different that Bailey. Our son (at this moment, at least) is set on the name Toby. I started looking around on Pinterest for puppy-related products and found a few fun ideas. This is the photo that got me started. This puppies dishes can be easily hidden with a tambour. No tripping over these dog dishes! A drawer for dog food. I think this could work in our new kitchen, though I wonder if we should replace the regular drawer with a bread drawer liner first. I see that the dog dishes are on a shelf below this drawer. Creative use of a toe kick drawer.